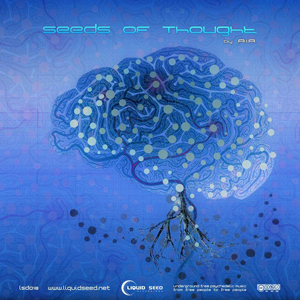 Liquid Seed Recordings are proud to serve Seeds Of Thought, a fresh collection of Greek downtempo and ambient compiled by Ambient Intelligent Application (A.I.A.). Featuring nine compositions from a range of well-known and established Greek artists, this release aims to take the listener to the fields where the seeds of thought grow. Let the music vortex open the path for peaceful thoughts and love and light. Mastered and engineered by Konstantinos Georgiou @ gk.audio.studio with artwork by Athanasios Kousouris (final edit by Angelo Zs). MP3 Download | FLAC Download | WAV Download · Download count: 5,402. Heard it a few days ago and can honestly call it my favourite VA released this year. Absolutely beautiful. It is about time that something has been released in the Downtempo section. I really like this VA, I am getting tired of all the dubbed out soul-less compositions as of late. This is refreshing in a good way. Big ups to all the artists on this comp, I will be playing a few of these tracks this weekend, thank you for your music and dedication. I agree with UndefinedDJ it seems rare to find music with soul in it these days. This release definitely has soul and I’m excited to give it an in depth listen. Many thanks!! it makes me feel like i can be a water drop when the clouds are getting grey. a small part of a rain storm on the surface of a deep ocean. Downloaded months ago but just listening now and, wow!, this is a superb release. Very good, and top cover art too. Thanks artists and Ekto!